A true modular concept for all your applications! With the Suunto Combo enables you to easily and quickly different consoles. The modular concept of Suunto Combo consoles allows you to put together guarantee high the console of your specific needs. Analog gauges, dive computers and compasses fit together like building blocks, which offers you the possibility to add as many instruments as you wish. The Suunto Combo modules can be combined in almost unlimited ways, giving you the opportunity at any time and how you want to change the composition of your console or improve. The Suunto Combo consoles are made up of four main modules: Finimetermodul, instrument module and two different compass modules. 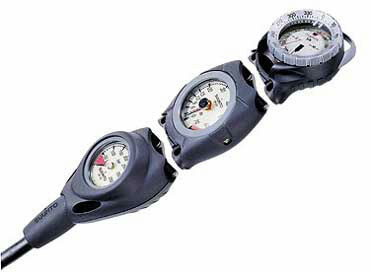 The pressure gauge is suitable for Finimetermodul with Suunto and Suunto Quick (Quick Release can be used). To the instrument module Suunto dive computer or mechanical depth gauge can be located. Depending on your choice, an SK-7 can dive compass, either on the back of the upper side or Finimetermoduls / instrument module are mounted. The Suunto Combo modules are made of thermoplastic polyurethane (TPU). TPU is extremely durable and flexible, it is scratch resistant and dimensionally stable and suitable for temperatures below 0 degrees. The design of the Suunto Combo consoles is curvy and ergonomic, so that they fit well in the hand. Whatever you want to achieve in diving, the Suunto Combo consoles will help you because of the extreme versatility and user-friendly functionality. If you love new challenges and emerge in the most varied conditions from tropical to Arctic waters, diving havens like, then you find the Suunto Combo consoles extremely useful and valuable.